Bali is famous for its beaches, with its golden sands and turquoise waters attracting ocean lovers from all over the world to revel in the glory of the Balinese coastline. Whether you’re a devoted surfer, a keen water sports enthusiast or just a sun-seeker looking for a gorgeous setting to get your tan on, Bali’s numerous beaches offer something for everyone. From the crowded tourist hot spots of Kuta and Nusa Dua to the more secluded secret beaches of the northern coast, these beaches get out vote for the must-see stretches of sand in Bali. Canggu is fast becoming the go-to spot in Bali for surfers and younger travellers, with heavy development in the area attracting a vibrant crowd seeking the most Instagram-worthy health cafes and drinking hot spots. But no matter how fast tourism grows in this region, Echo Beach will always remain the heart and soul of Canggu. This black sand beach offers some of the best surf breaks on the island, with a coastline full of locally-owned restaurants and bars perfect for a budget-friendly Bintang or Nasi Goreng between waves. Cliff-top sunset dining options abound, providing gorgeous views over the coast. Entrance to Echo Beach is at the end of Jalan Pantai Batu Mejan, where you’ll also find a handful of surf rentals and board repair shops. 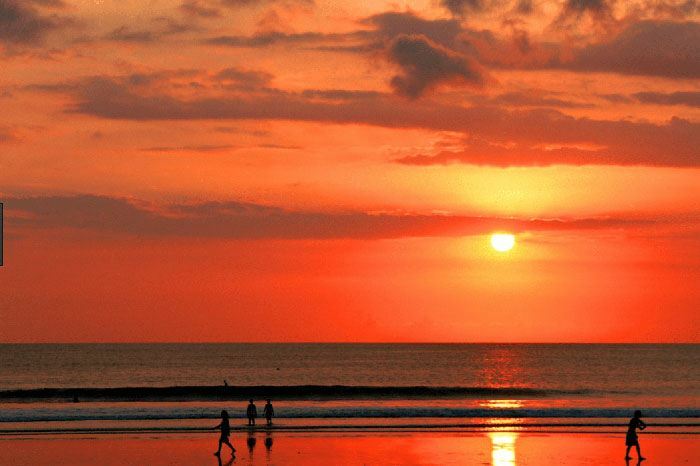 Kuta has its fair share of haters, but whether you love or loathe the town itself, there’s no disputing that Kuta Beach remains one of Bali’s must-visit locations. Yes, there are hordes or people and yes, the beach vendors haggling for you to buy a bag of pineapple pieces or knock-off designer watches can be exhausting, but this is all part of Bali’s charm. If you can embrace the chaos of Kuta and accept it for what it is, you will see that Kuta Beach offers some of the most stunning sunset views on the whole island, with the five kilometres stretch of sand providing a great location for surfing, swimming, sun bathing and people watching. While mostly frequented by surfers, Padang Padang is one of Bali’s most awe-inspiring beaches, providing the very image that comes to mind when one conjures up thoughts of the exotic Balinese coast. Located a couple of kilometres between Uluwatu and Bingin, and accessible via a flight of stairs spiralling through a majestic hollow rock entrance, Padang Padang offers a 100 meter stretch of soft sands and blue, frothy waters. The surf break is located further out, leaving the shorefront water relatively calm and ideal for swimming if the weather is right. There are plenty of food vendors around, and sun loungers can be rented by the hour or day for ultimate relaxation. Sanur was Bali’s original resort town, and Sanur Beach still offers a charming blend of the old and the new. Once a thriving fishing village, Sanur Beach is still frequented by locals and is a beautiful spot to see Balinese families spending quality time together, picnicking on the shores and flying kites in the shallows. Sanur’s coastline provides a mix of international resorts, restaurants and bars, with local market stalls and upscale homes. A paved cycling trail runs parallel to the sand and hiring a bike to cruise the beautiful ocean stretch is a fabulous way to spend an afternoon. Sanur Beach is where the boats leave for the nearby Nusa Lembongan island (which is visible from the beach on a clear day) so it can get busy in the mornings and evenings when the day-trippers flock to the area. Green Bowl Beach is one for the adventurous, as its one of Bali’s most secluded beaches and takes a bit of effort to reach. Located in the quiet village of Ungasan, which is approximately 15 kilometers from Kuta, Green Bowl Beach can only be accessed by climbing down a 75 meter stretch of steps winding down a steep cliff face. 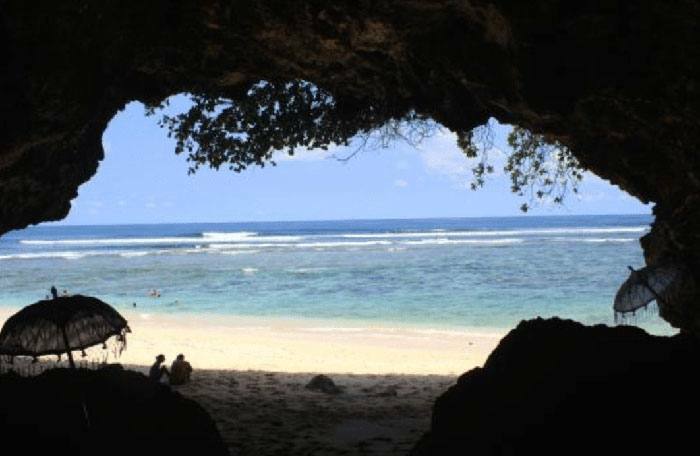 If you have it in you to make the journey, you will be rewarded with a 30-meter strip of one of the most unspoiled, exotic beach locations in Bali, complete with limestone caves providing the perfect escape from the sun. Don’t be put off by the challenging location – it is the reason Green Bowl Beach keeps the large crowds away and makes this one of the few beaches in Bali you can visit without swarms of other travellers.